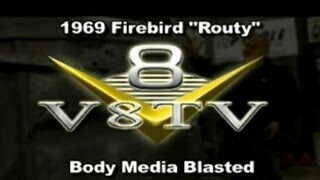 Category: 1969 Pontiac Firebird "Routy"
Classic Industries is a big player in the restoration parts market, and we've worked with them on various projects including our 1969 Firebird "Routy." 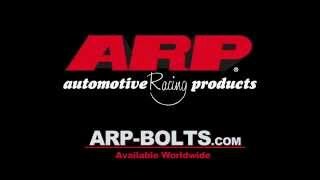 Here's the latest from the CI team, a new Mopar line! 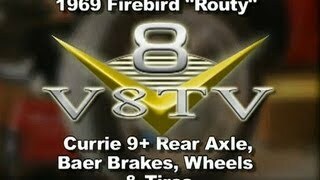 We've finished the '69 Firebird, and we're really happy with the way the car looks and drives! 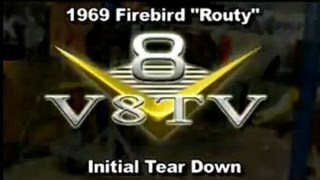 Check out the V8TV "Routy" Microsite for thousands of build photos and info on how you can get a limited edition DVD of the entire build! 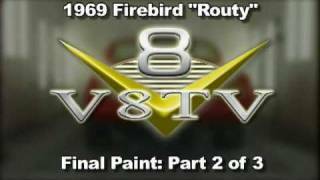 The final video covering the paint process on our 1969 Pontiac Firebird project "Routy." This time, we're laying out the stripe design and spraying the DuPont silver and Gun Metal stripes. Later, we do the initial wetsanding with the 3M Trizact system, including the new 3M Denibbing gun. Lastly, we polish the car using 3M products. 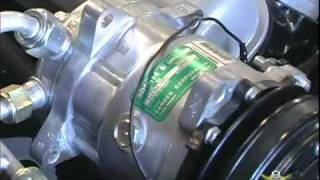 Next is the final assembly and installation of Holley's Avenger EFI system. 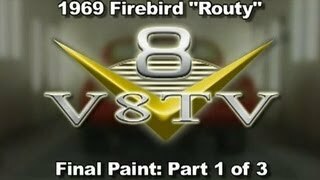 The paint sprayout continues with our 1969 Pontiac Firebird project "Routy." This time, we're spraying DuPont Hot Hues Red Hot Meltdown color and intercoat clear in preparation for the painted stripe treatment next. We're spraying with the 3M PPS system to minimize cleanup time and solvents, and to help measure the mixture accurately. Eastwood Pour-It lids also make things easy, and SAS Safety gear keeps everyone in top shape. Once the color was applied, a 3M Sun Gun was used to check the coverage. 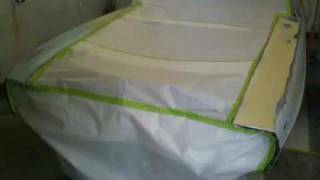 Part 2 of the paint application series. 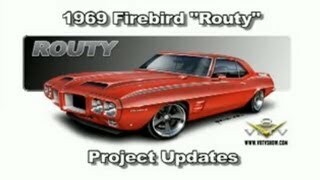 In this video, we final install the classic auto glass innovations flush glass and prep our 1969 Pontiac Firebird "Routy" with 3M wetsand paper, tape, and mask paper and bring it to the booth for final application of DuPont Hot Hues Red Hot Meltdown color. Part 1 of 3. 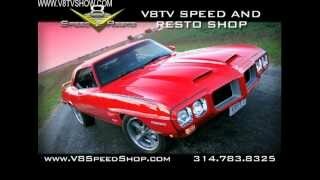 The time came to install the rebuilt 1973 Pontiac 400 into our '69 Firebird. It's running a rebuilt bottom end, roller rockers, #16 Pontiac iron heads, a Professional Products intake manifold, MSD ignition, h Holley carb, Royal Purple break-in oil & filter, and Eastwood coated long-branch exhaust manifolds leading to MagnaFlow exhaust. Also shown is the Vintage Air compressor and accessories from Classic Industries. 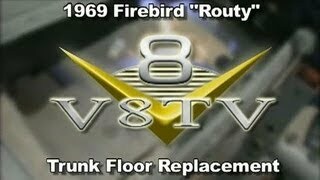 We wanted our 1969 Firebird to be fun to drive, and that ment keeping the interior free from unwanted noise, and climate controlled. 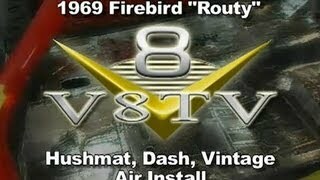 This time, we're installing Hushmat sound deadoner and heat insulation in the cabin, then adding a Vintage Air A/C system to keep the occupants cool. 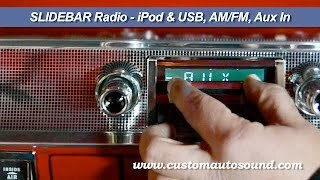 Some reproduction 1969 Trans-Am style gauges and dash pieces from Classic Industries as well as a Flaming River tilt steering column complete the job. 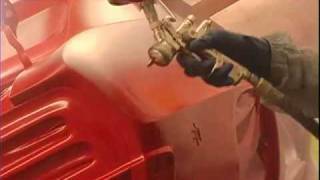 After completing all the bodywork on our 1969 Pontiac Firebird, we disassembled the body to paint the tub with DuPont Hot Hues Red Hot Meltdown 2-stage urethane. After the red had flashed, the crew masked off the jambs and sprayed them with DuPont Clear. 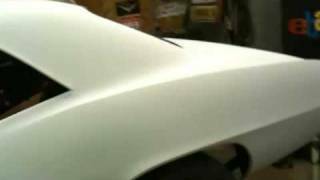 Then the fenders, doors, hood, and other parts were shot red, and the jambs and backsides cleared. It looks good in red! 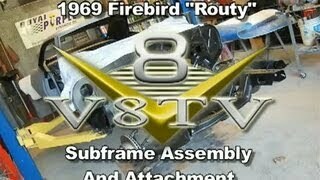 After the subframe was re-attached to our 1969 Pontiac Firebird "Routy," the reassembly began. 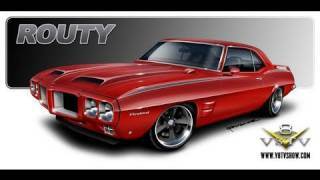 First up was the sheetmetal, namely the doors, fenders, core support, and the reproduction steel Trans Am hood. We had to do a few tricks to make them all line up correctly, but it wasn't too bad of a project. Here's how the process went. 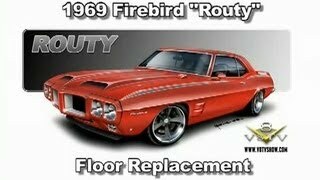 We reassembled our restored front suspension with some new tricks to make our 1969 Pontiac Firebird "Routy" drive and handle better. First we replaced all the stock worn-out control arm bushings with some new Global West Del-A-Lum bushings for minimal deflection and smooth articulation. Then we replaced all the loose steering components with new parts from Classic Industries, including a new steering box, tie rod ends, center link, ball joints, idler arm, and pittman arm. Once we could put the wheels back on, we rolled the subframe under the body, aligned it, and bolted it up. Out back, we added some Del-A-Lum bushings to the Detroit Speed & Engineering 3" drop leaf springs and put the rear axle assembly back in the car. Classic Industries had more hard-to-find nuts and clips for the front leaf spring mounts. Now we can hang all the sheetmetal back on the car and start the panel alignment! 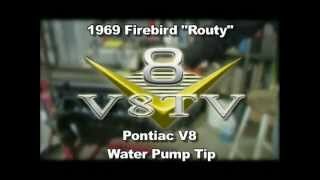 The Pontiac 400 V8 engine that we're using in our 1969 Firebird project called "Routy" came to us completely as a rebuilt long-block with all new parts inside, but we were charged with the task of doing the final assembly and detail work. 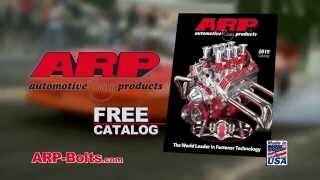 This time, we're test-assembling the brackets and parts on the engine, and came across a great tip to help keep your Pontiac V8 engine running cool. 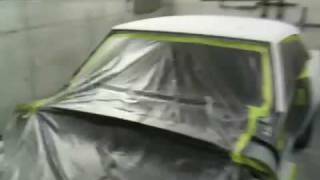 Our 1969 Firebird takes a bath in Standox Sprayable Polyester filler.